An ODOT repaving project in Fulton County next summer will include Shoop Avenue, from Airport Highway through the Elm Street intersection, then on Elm Street through the Clinton Street intersection. Back-to-back road projects scheduled next year in Fulton County by the Ohio Department of Transportation will concentrate mainly on portions of US 20A (Airport Highway) and on Shoop Avenue in Wauseon. Beginning in June of 2019, ODOT will resurface a 5.7-mile stretch of US 20A from Ottokee Street in Wauseon east to State Highway 109. The approximately $4.4 million project will include a side job to replace a culvert located between County Road 12 and County Road 13 and is scheduled to be completed in July. 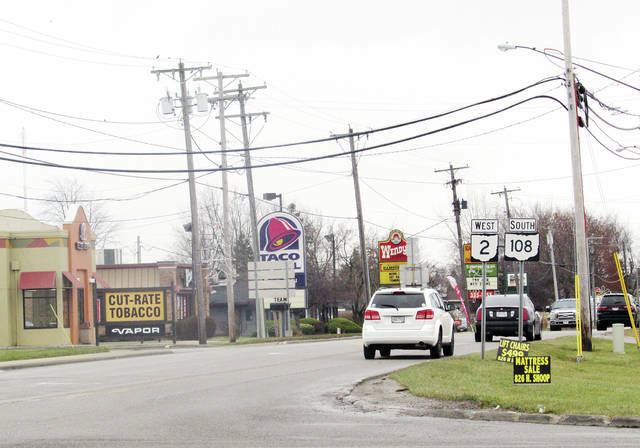 The City of Wauseon will team with ODOT for the city’s portion of the first project, which will resurface Shoop Avenue from Airport Highway through the Elm Street intersection. Resurfacing will then switch to Elm Street through the Clinton Street intersection. The city’s estimated $710,000 cost will be paid through its capital and state highway funds, a permissive tax, and street revenue. Dennis Richardson, Wauseon’s Public Service Director, said only one lane at a time of Shoop Avenue will be paved, and the street will maintain two-way traffic. He said the project shouldn’t upset traffic flow to nearby businesses. Flaggers will maintain two-way traffic on Elm Street. A separate, approximately $4.2 million resurfacing project on US 20A will begin in July and end in October. It will start where the first project ended at the Ottokee Street crossing, and extend to the intersection at State Route 66. At that point, resurfacing will begin on State Route 66 and continue to the County Road J intersection. The second project also will involve culvert replacement, one between County Road 16 and County Road 17, and one between County Road 19 and County Road 20. “We’ll try to keep those projects as short as possible,” ODOT District 2 spokesperson Rebecca Dangelo said. She said traffic in the resurfacing areas will be maintained either with automated stop lights or flaggers. Both US 20A resurfacing projects were initiated in June of 2017, and are expected to be approved by ODOT’s central office in Columbus. Bids for both projects will likely be sought in May. Other county ODOT projects next year will include culvert repair on U.S. 20 between County Road 5-1 and County Road 6 and a resurfacing project on State Route 120 between County Road 3 and County Road 7. Both are estimated to last from May to August.